When I said that New California has a wild life, I didn't lie! Yesterday morning, when I did a zombie walk to the kitchen trying to open my eyes and get ready to leave for work after long 4th of July weekend, I noticed that there is a big bird sitting on the bird feeder plate. After several attempts to focus I actually noticed that the "bird" has a fluffy tail, and is indeed a squirrel. 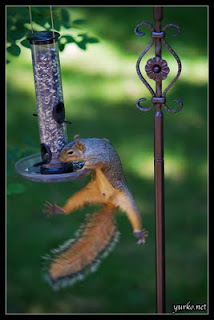 However today appeared to be even more interesting: couple of ninja squirrels raided the bird feeder again, and this time Yuriy got a couple of funny pics. They probably do this kind of staff every day during the day when we are gone... Wouldn't it be a nice reason to quit working?..